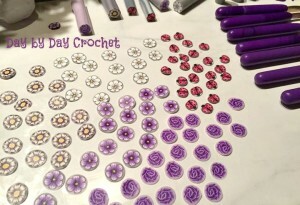 A few years ago, I fell in love with the custom-made clay handles made by Jennifer of Day by Day Crochet. 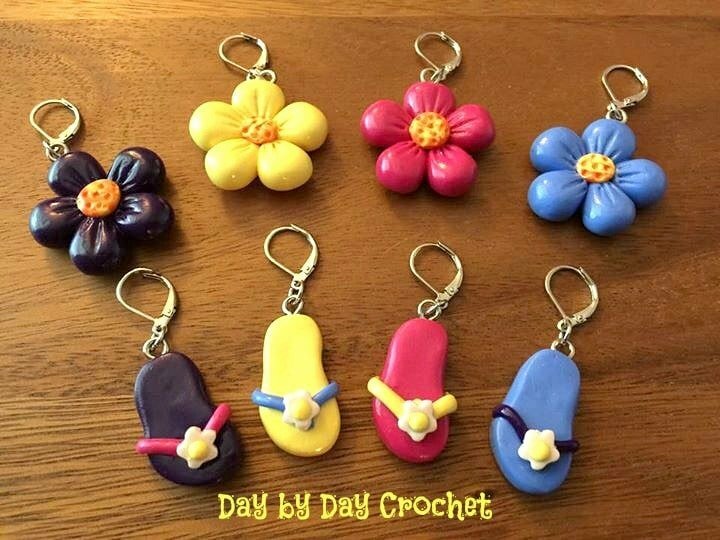 I am sure some of you are already very well acquainted with the stunning quality of her polymer clay work but for those of you who have not stumbled across her Facebook page yet, I’d like to introduce you to the very talented Jennifer, of Day by Day Crochet. “My name is Jennifer Ellingwood and I’m a full time elementary music teacher at two elementary schools (16 years!) and during the summer I am one of the assistant directors of our high school marching band. My husband was in the Navy until a few years ago when he got out to pursue a degree in mechanical engineering technology from Purdue University. The stitch markers led to buttons, which eventually led me to start applying clay to crochet hook handles. Before I knew it, I was up to my eyeballs in orders for hooks, buttons, and stitch markers! I started Day by Day Crochet about 3 years ago, and this July will mark my 3rd year working with polymer clay, which has turned into a passion of mine. I do not have an Etsy account, yet, but it may be an option in the future. At this time, I take orders by posting certain items on my page that I will take orders for and customers can message me about placing an order. While I still do a few “sculpted” items, most of my hooks now are made with millifiori canes. 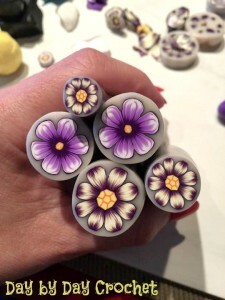 These “canes” are pictures and images that I sculpt out of clay and then roll into a long roll or log similar to the festive tube cookies that you can slice and the pumpkin or Christmas tree image is on every slice. I take the slices of my clay cane and apply them to my designer crochet hooks. You can check out Day by Day Crochet at my Facebook page www.facebook.com/daybydaycrochet . Jennifer has generously agreed to donate one of her beautiful hand-made clay handled hooks to one of my lucky readers! Just like the handle on my hook! I chose a size N-9.00 MM because they are difficult to find here in Canada and the one I purchased in the United States last year keeps falling apart…the bamboo handle it came with keeps sliding off no matter how many times I glue it back together! I love my new 9.00 mm Ladybug Hook (yes I have a name for my pretty hook). Drew is obsessed with it too! He loves all things ladybug right now and is constantly trying to get his hands on my hook for himself. This is the first polymer clay handled hook I have used – and it is surprisingly light! I honestly thought it would be much heavier but the handle barely adds any weight to the hook at all! The handle itself is so smooth – there are no ridges, bumps or rough edges to the finish on the handle. The colours are so vibrant and the design is flawless. You can barely see the overlap created by layering the canes on the handle. It is gorgeous and I can’t wait to sit down and use it to design a pattern! I believe it to be a very good alternative to using a standard crochet hook. With my hands I have to be careful which hooks I use – and I need something with a substantial handle in order to be able to crochet for longer periods of time. It helps me maintain a grip on the handle without having to close my hand too tightly. I did ‘test-drive’ my hook and it works beautifully for both a knife-hold (my normal way to hold) and a pen-hold (the way I hold my hook when my hands are super sore). It sits easily in the space between the thumb and forefinger (the lower curve of the hand) making it very easy to crochet with. I hope you take the time to visit Jennifer on her Facebook Page and maybe even click the lovely “like” button to have her posts added to your Facebook feed 🙂 This way you will see some of the one-of-a-kind products she develops and offers up for sale! When I purchased my hook I used paypal to pay – for those of you wondering how you will purchase a hook directly from her Facebook Page. She invoices you to the email you Private Message her and you can pay with Paypal. These hooks are beautiful! Would love to add these to my collection! Congrats to The lucky winner And thanks for The chance to win! I actually have used a clay hook that I got from Mad Mad Me and I absolutely love it! I have never tried a clay handled crochet hook, but I think it would be delightful to work with. The only hooks I have are plain aluminum, which have sufficed until now. But as I am crocheting more (still pretty much a beginner), I would really like something more comfortable. I would enjoy trying one of these! I think you are my favorite crochet site, blog or otherwise! Your explanations are very clear, and the patterns are quite clever. Not to mention, the giveaways are fantastic (just wish I could win)! I love your blog! Thank you for posting so many wonderful crochet patterns! I haven’t tried clay handles! 🙁 Would love to, though!! I am continuously in awe and always inspired by your work! I have used clay handle hooks & I love them. My only problem is finding a hook case/organizer that has pockets they fit in. Yes, I have several and I love them! No I’ve never tried one but can’t wait to. I have never tried a clay-handled hook, but I sure would like to try one! I have seen so many positive reviews on these hooks ! 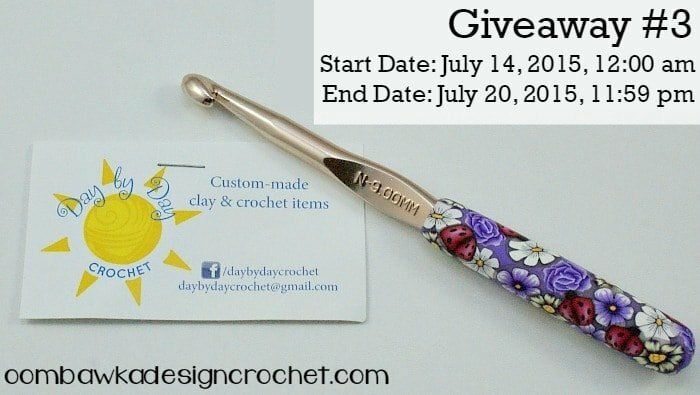 I have never tried a crochet hook with a clay handle, but I like my hooks to feel smooth in my hand and so I’d love to win one of the fabulous hooks. These hooks are so beautiful. I would just love to win one ! I have not tried clay handled hooks before but would love to try. Thanks for the giveaway. I have been itching to try these hooks for a while now. I have a neuripathy and specially made tools help make things easier for me. I have never used a hook with a clay handle or any other type of special handle! No, I’ve not used a clay hook before, but I would love to try one! They are so beautiful! I would love to have one of these hooks ! I have never had the opportunity to use a clay handled hook, but I sure would love to try it. That is such a gorgeous hook! Thanks so much for the opportunity to enter this contest. You have such wonderful giveaways. I have not had the opportunity to try one of these hooks but they are absolutely gorgeous and would be more than thrilled to win one and use it regularly! I thought I would try again to win. These handles are very pretty and I have never tried to use one before. I usuall use a g or h hook when I crochet. Love the site. I haven’t used a clay handled crochet hook, yet. i have never use a hook with a clay handle before, i have seen them and they are beautiful. i would love to have the chance to try one of the clay handle hooks, they look like they would be easier on my hand than a regular crochet hook. thank you for giving us a chance to try one of these clay handle crochet hooks. Thank you both for this opportunity! I think I would love to have a Boye hook, maybe a size g or smaller would be great. Beautiful styles! No…have never used a hook like these before. Actually is first time I even saw one. They are Gorgeous!!! I have never tried anything but the generic hook. some of them are so thin that i cannot use them! It would be great to use one with a not only bigger, but a beautiful handle! Oops! forgot to mention – if (wish I could say when) I win, I’d LOVE an H hook and love the color shown above…as is…don’t really care which brand, but if I have to choose, would probably choose the Bates. Congratulations, Rhonnda! two years! WOW! That’s awesome! you have shared so much and helped so very many of us! I know how much time and work go into these – and just want to let you know it is very much appreciated! You work – and GIVE – tirelessly of yourself and have truly helped so many! A sincere THANK YOU! for all that you do! And best wishes for ten times two years – of increased success! I have never used a hook with a clay handle. I would sure love to win this one — it is GORGEOUS!!! I do have one clay handle hook, size H, and I **LOVE** it. 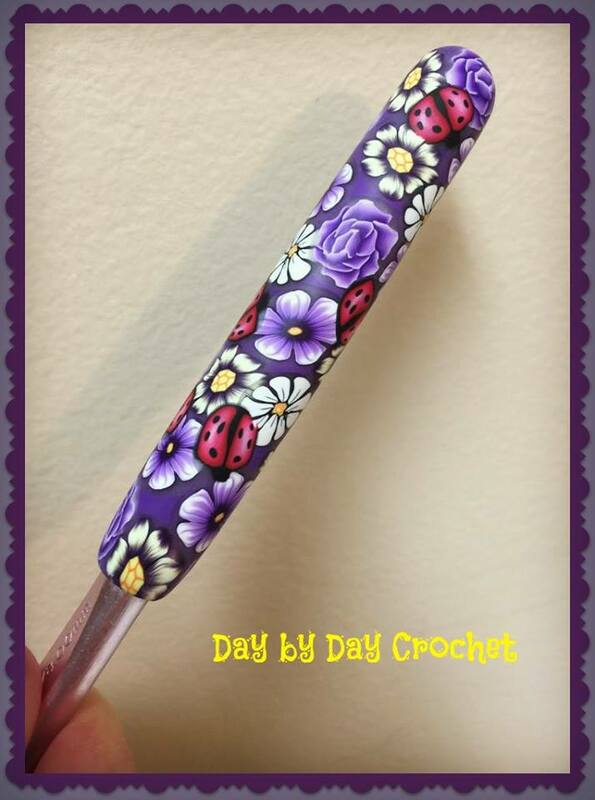 I have not yet tried a clay-handled crochet hook…. Maybe it will help with my arthritis. Beautiful hooks are so much nicer to work with – constant inspiration! The ladybugs are adorable! I never crocheted with any handle that had something extra on it, just with bare hooks. I have never used a clay handled crochet hook, but I would love to try one of these beautiful hooks. Thanks for the chance to win! I have never tried a clay handled crochet hook. I look forward to trying this beautiful crochet hook. Thank you for this opportunity to win one of your hooks. I have three clay handled hooks – absolutely love them! I have never tried a hook with any kind of material on the handle, but would love to have one. I’ve known people who have various kinds of hooks, and each person has their own preference. I’ve never used a clay-handle crocket hook, but I would love to try one! That is one gorgeous hook! I’ve just got plain metal ones in different colours. I need to get me some lovely hooks. i have never tried one before…right now i made a handle using the rubber bands and a wonder loom! I have 2 clay handled hooks and love them. No I have not tried a clay handle hook but would love to! I love all of these amazing hooks! Yes, I have and I love it. They are great for the smaller hooks. I’d love to have one of these hooks but am disabled and on a limited income so choose to buy yarn, etc., rather than expensive books, sigh. handled hook but would LOVE to! They are beautiful AND look like they’d be very comfortable! I have never tried one of these. They sure are pretty and I bet it would help these old hands crochet a little longer. Does she have any with butterflies on them? I bought my first clay handled hook last month. I’ve “tested” it on a dishcloth and love it! Thanks for the opportunity to win a new hook! These are so beautiful! Thanks for sharing!! I’ve never used a clay handled hook. Can’t wait to try one. They are beautiful pieces of art. Thanks for the giveaways. I haven’t tried a clay handled hook. Unsure if I would like it. You know, old dogs, new tricks? I have never had an opportunity to use hooks with clay handle. If I win this will be my first. since I really don’t have any way of having one .. so thank you for this giveaway. I hope I win. Love Jennifer’s hooks. I own several and they are AWESOME!!!!!! 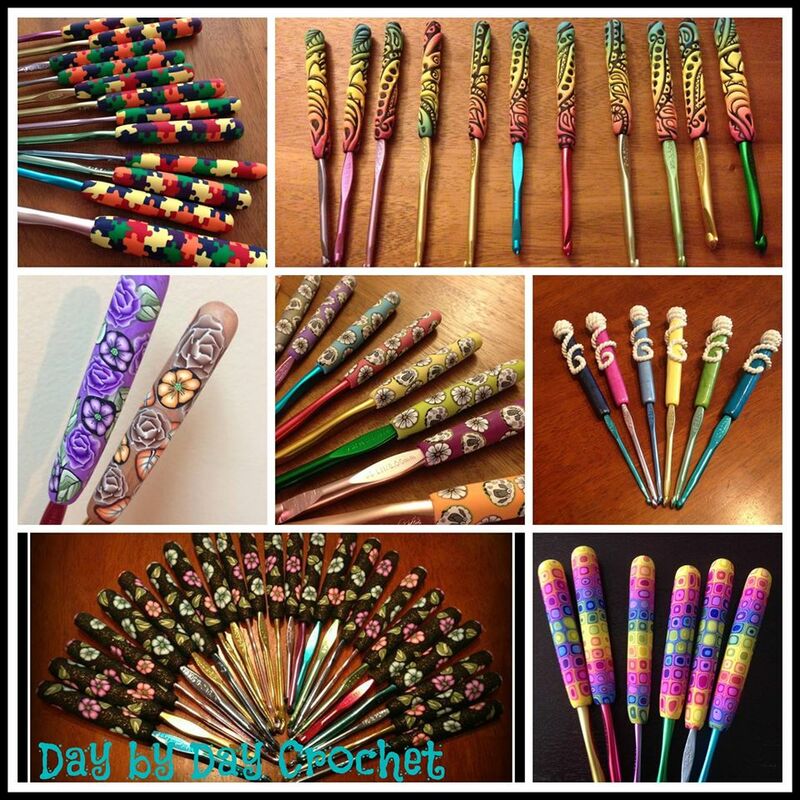 I’ve never tried a clay handled crochet hook – but would love to. Thanks for the chance to win one. Thank you and Jennifer for the chance to win one of her awesome hooks.